The six year old primary file & print server at my church started screaming one Sunday morning. Eventually we verified that the disk controller was chirping about failure of one of a pair of mirrored drives. It was possible to turn off the "siren" and operate without the mirror drive. However, that machine's days as a production server were numbered, since replacement had already been discussed for several years. The hardware requirements for the replacement machine were minimal. Placing a casually replicated machine in a separate building had obviated hardware redundancy within the machine. A pair of low-end Optiplex desktops, each with "only" 2GB of memory (4 × the old machines) and 160GB disk space (8 × the old), replaced the old servers. Besides "if it ain't broke, don't fix it", the strongest motivation for procrastination about changing the servers had been trepidation about replacing NT4 Server. Six years ago, whomever replaced a NetWare environment with NT4 understood good practices for using the NT domain conventions and had taken good advantage of NT domain features. Based on some experience and lots of others' reports, migrating an NT domain to Active Directory in Windows 2000/2003 requires planning, new procedures and training. All of those take time and effort we didn't want to spend, and especially didn't want to spend under time pressure. The first tact was to try to install NT4 Server on the new hardware. The showstopper was the lack of NT4 drivers for the SATA disk drives. It turned out that NT4 was not alone with this problem. Fedora 6 and "Test 3" of Fedora 7 were also missing needed SATA drivers. Ubuntu 7.04 has a driver, but it doesn't work on these machines. Challenges with SATA drivers are a story unto themselves. However, Windows XP Home that came with the machines seemed to work fine as a "host" for VMware Server! So the solution was and is to run NT4 Server as a VMware virtual machine hosted on XP Home. After many test installs, test restores from the backup tapes, and other testing, this structure was deemed ready for production. Four weeks later, all seems well. I'm delighted with the overall performance, and am especially pleased with speed of tape drive operations. The spare memory and disk space will not go to waste. Though Linux probably won't displace Windows, an ad hoc ubuntu machine has been in production since last year. More carefully deployed Linux virtual machines (on VMware on XP Home) should soon displace the ad hoc physical machine. Now that Windows 2008 Server test releases are publicly available, maybe there can be relatively casual planning and testing for eventual migration to Active Directory. Separately, my first experience with Parallels was a disappointing reminder that these virtual machines are seemingly not as precise replicas of the physical machine as those I first experienced with CP/CMS. A friend running Windows 2000 on a decrepit 486 machine had long been contemplating buying a Mac. A few weeks ago, she got a beautiful iMac, and bought Parallels and XP Pro to run a Windows-only database application. 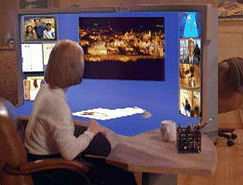 Unfortunately, her usual consultants were unable to get the application working in a Parallels virtual machine. The application provider knew of the Parallels problem and had no solution. So I think my friend gave up her iMac and settled for a new Windows-only machine.